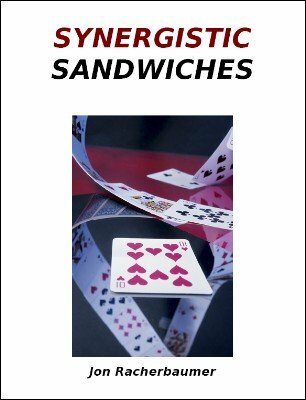 Sandwich tricks, long popular with cardmen, are nothing more than glorified locations. What makes them a little different is that the selections are found at specific places: between two other cards. Perhaps the best way to present these stunts is to perform a few in a rapidfire, successive way—each phase following the preceding one in a logical, progressive way. Also, each phase should be stronger than the preceding one. When such phases unfold in this manner, the overall impression will likely have more impact and be memorable. And this is exactly what Racherbaumer has engineered in his Synergistic Sandwiches routine. You will learn seven phases one stronger than the next. If you learn this combinatorial routine, you will have something lay people will talk about and remember. 1st edition 2006; 37 pages.